A rich body of evidence suggests that collaborative learning holds many benefits for computer science students, yet there is growing recognition that neither collaborative learning itself, nor the innovative curricula in which it may be situated, are “magic bullets” capable of single-handedly solving the computing pipeline problem. In contrast to being a one-size-fits-all solution, collaborative learning is highly dependent upon characteristics of the collaborators and on fine-grained interactions. This project is led by PI Kristy Boyer at the University of Florida and is funded by her CAREER award. The overarching research question of the CS-CLIMATE project is, “How can we identify and support the facets of collaborative dialogue that are particularly effective for fostering learning, sense of identity, motivation, and continued engagement for diverse computer science learners?” The project will investigate this question through three thrusts: 1) Collect a rich set of computer science collaborative learning data. The project will leverage the ASCEND learning environment developed by our lab, which supports remote collaboration with textual natural language dialogue, synchronized code editing, and integrated repository control for two or more collaborators. Partnering with three participating institutions: North Carolina State University, Meredith College (an all-women’s institution), and Florida A&M University (a minority-serving university with 90% African American enrollment), the full suite of collected data will also include student characteristics of gender, race/ethnicity, personality profile, and achievement goal orientation, while measures of outcomes include learning, sense of computing identity, motivation, and engagement. 2) Examine the fine-grained facets of collaborative dialogue that are particularly effective for diverse computer science learners. By leveraging machine-learning frameworks for dialogue analysis developed within our lab, the project will see the creation of fine-grained, theoretically informed models that capture collaborative dialogue and problem solving phenomena associated with learning, identity development, motivation, and engagement. 3) Implement and evaluate evidence-based pedagogical support for fostering effective collaborative dialogue. The project will extract a set of evidence-based pedagogical strategies for fostering effective collaborative dialogue tailored to student characteristics. These evidence-based pedagogical supports will be evaluated through quasi-experimental studies. 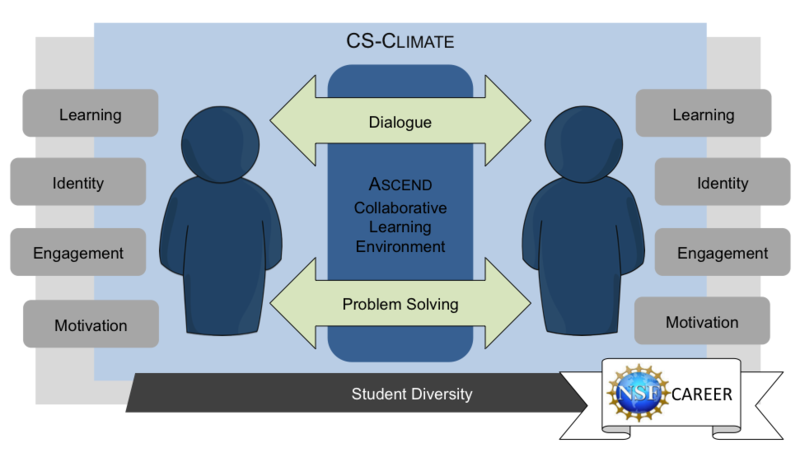 It is hypothesized that CS-CLIMATE pedagogical support will significantly improve learning, sense of identity, motivation, and continued engagement for students overall, and for women and African American students in particular. In addition to testing this primary hypothesis, the project will produce fine-grained sequential analyses and rich qualitative findings that further the state of knowledge about how diverse students learn computing.